From the first step of the evaluation process, even though it may be one of the last evaluation tasks, explicitly discuss the content, sharing, and use of reports during the initial planning of the evaluation and return to the discussion thereafter. Most importantly, identify who your primary intended users are. Use of the evaluation often depends on how well the report meets the needs and learning gaps of the primary intended users. Besides the primary intended users (identified as part of framing the evaluation), your findings can be communicated to others for different reasons. For example, lessons learned from the evaluation can be helpful to other evaluators or project staff working in the same field; or it may be worthwhile remolding some of the findings into articles or stories to attract wider attention to an organisations' work, or to spread news about a particular situation. 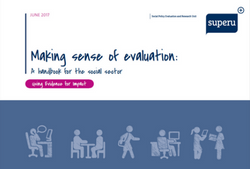 You will share the findings of the evaluation with the primary intended users and also other evaluation stakeholders. Identify the primary intended stakeholders and determine their reporting needs, including their decision-making timelines. Develop a communication plan. Produce appropriate written, visual, and/or verbal products that communicate the findings. Plan the reporting products to make sure they are accessible, including addressing issues such as limited time, low literacy, and disabilities. Draw on the findings and an understanding of the implementation environment to make recommendations such as how the programme can be improved, how the risk of programme failure can be reduced or whether the programme should continue. (This is often useful but not always needed). Plan processes to support primary intended users to make decisions and take action on the basis of the findings. Hi, I wonder if anyone can share resources on progress reports. I manage a Fund and want to ask grantees to prepare progress reports that are smart and useful, and help me (and them) understand what was done, how, why, any preliminary results, changes to be made, etc. I am looking for examples where the process was not heavy and difficult for the grantees, but easy and useful. Any ideas will be very valid. Thanks.